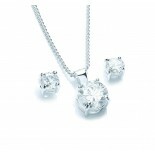 This versatile pendant and earring set can be worn time and time again, day or night. The pendant comprises of an 8mm claw-set, brilliant-cut cubic zirconia suspended on a fine curb chain 41cm (16') plus 5cm (2') extender. The matching earrings hold two 4mm brilliant-cut cubic zirconias in a 4 claw-setting and feature a post and butterfly fastening, suitable for pierced ears only.